Are ads stalking you online? If you’re like Brian Chen, writing for the New York Times, you might think so. He describes getting haunted by ads for watches after perusing a few eCommerce websites. His web surfing, Facebook and Instagram feeds… loaded with watch ads. He calls these stalkers ads. The targeted, persistent ads that follow you around, sticking themselves into your craw until you finally give in and buy (and even then they may keep following you). 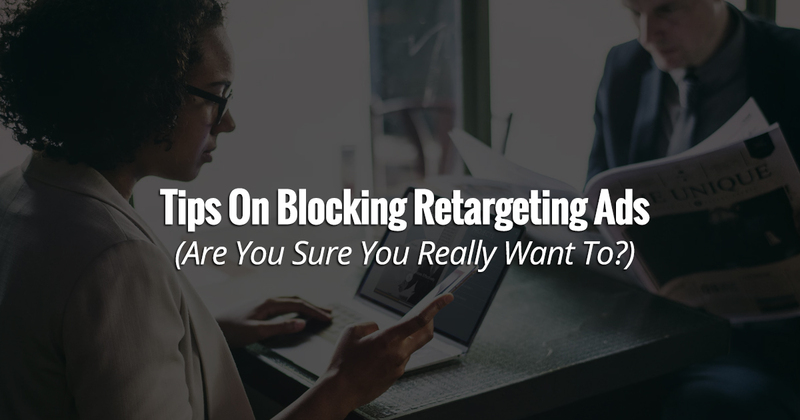 At marketing agencies like Marketing 360®, we call this retargeting, and we find it to be an effective tactic for increasing sales. We don’t think of ourselves as sales stalkers, but Brian makes a point. There are times when you might want to refresh the way promotional content is being served to you. Periodically, clear your cookies. When you clear your cookies, you clear the ad trackers on your browser, which will stop ads from websites you previously visited. Apple, Google and Microsoft have published instructions on how to clear data for their browsers Safari, Chrome and Edge. Reset your advertising ID. In addition to cookies, Android and Apple phones use an advertising ID that tracks you, providing marketing data. Reset it whenever you want. On Android devices, you can find the reset button in the ads menu inside the Google settings app, and on iPhones, you can find the reset button inside the settings app in the privacy menu, under advertising. Periodically purge your Google ad history. Google offers the My Activity tool, myactivity.google.com, where you get an in-depth look at the data that Google stored about you, including the history of ads you have loaded. Choose the data you want to delete. Brian goes on to discuss ways you can go farther to block ads and use a private browser, but we’d like to reiterate that we don’t see this type of advertising as stalking. So, we’d like to pose a question. Do you really want to block ads? The wording Brian Chen chooses in his article reveals an important point. He’s not really that concerned about annoying ads ruining his Instagram stories. He acknowledges at that ads have “always been annoying”. He claims that now they’re worse. But they’re not. Ads are part of the world of commerce we live in. They have always been there, and they’re not going anywhere. We live in a world where advertising is necessary. Businesses sell goods and services. And advertising revenue pays for content like the very article Brian wrote for the New York Times. When Brian talks of being “stalked”, what really concerns him is that his online browsing is being tracked. Advertising and marketing entities are collecting information about his digital life, compiling a profile of not only his interests, but his predilections – and perhaps even his vices. We all feel this growing pressure on our privacy. The digital world is eminently trackable. In fact, it’s much like walking through fresh snow. As you move around, you can’t help but leave a trail. To that point, it may ultimately be futile to try to avoid having information collected on your browsing. The only sure-fire way to do this is not to go online. But we’re guessing you’d rather not do that. In fact, we’re guessing that – if you think about – you’ll find that personalized ads aren’t such a bad thing. So you’re shopping for deals on skis, or an unusual style of hat, or a certain type of motorcycle. Would you like to see ads that offer content and deals on the items you’re actually interested in, or do you prefer to have ads “sprayed” at you randomly? Keep in mind that the ads are going to be there one way or the other. Also consider the publishers. If you’re on the Washington Post and you click an ad, they get some revenue from that click. What ad are you more likely to click on? One for the skis you’re interested in or one for nicotine patches – when you don’t smoke? Brian Chen is a tech-savvy person, but we think his complaint is increasingly frivolous. Like it or not, if you use the internet, your browsing behavior will be tracked. Brian details his efforts to eliminate ad tracking from his online browsing. He finishes by expressing relief that an irrelevant ad for 7-11 shows up on his Instagram, indicating he’s not being tracked. Well done, if that’s your choice. As for me, ski season is around the corner, and I need some new boards. If your business has some great deals, I look forward to seeing your ads. Cause you know what? I don’t drink slurpees anymore.